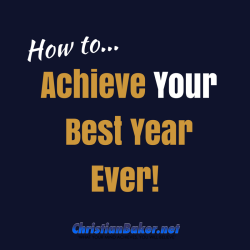 How To Achieve Your Best Year Ever! Would you like to make this year, your best year yet? Coming up I share how you can get ready to make the new year, your best year yet! Ensure you celebrate your wins, take the lessons, learning and discoveries from the past year into your plans for the new year ahead. Now it’s time to focus on your intentions, plans and aspirations for the new year ahead. Our resistance to doing and achieving anything, always because of lack of clarity, how can you achieve your best year yet, if you don’t know what that would look like for you. It’s often said we get more of what we think about, so allow yourself some time to think picture and imagine about the things you actually want. So allow yourself some time to get clear on what you want to enjoy, experience and achieve in the next 12 months? Maybe break it down into the next 3 months, 6 months, 9 months & then 12 months. Then you can create your do list, of all the things you are doing to help make it happen! Your action for today is to ask yourself, How best can I make 2018 my best year yet? Then Create your do list… and then focus on doing the things that will help make it happen! Please feel free to visit my YouTube Channel, click subscribe, and leave a comment below the video, letting me know how you are going to make this your best year yet! Wishing you all the very best for an amazing New Year, and remember – what your mind believes you will achieve – so think differently, believe in yourself, take action and achieve the life you want!